Manitoba old time fiddler, Bob Kuzak, occasionally sends me transcriptions, recordings and other information from his collection of Canadian fiddle music, which I am always delighted to receive. The most recent one is Happy Acres Two-Step, composed by Cecil “Cec” McEachern. I was sad to learn that the last surviving member of the hugely influential band, Don Messer and His Islanders, had passed away in January of this year. 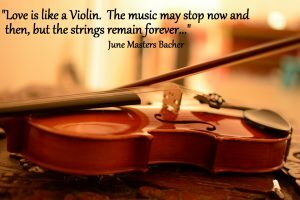 Long after fiddle music had been replaced on radio in the U.S. by other popular forms of music, Canadian radio and TV stations continued to air variety shows hosted by fiddling band leaders and routinely included fiddle music as part of the regular programming. This reinforced the already strong Canadian influence among fiddlers along the northern tier of states who could tap into this musical resource. Cec McEachern was born around 1926 on Prince Edward Island, where he resided most of his life. His family all played music and he was one of those gifted individuals (of whom I am so envious) who could hear a tune once and immediately play it back. After WWII he joined up with Don Messer and played lead and back-up guitar, bass and fiddle with the Islanders until 1973, when Mr. Messer passed away. He composed many tunes which were played by the band and spread throughout Canada via the broadcasts and recordings. I remember hearing McEachern’s Breakdown played by fiddlers in Oregon back in the 1970s. It’s a great tune too and may appear in this series at some point. Go to www.youtube.com and enter Cec’s name and you can hear him play a selection of tunes. I learned this stellar tune some years back from the award winning bow maker, Morgan Anderson, then of Bainbridge Island, now of Rosalia, WA, who had picked it up from a tape of fiddler music. Interestingly though, Louis Riendeau of New Hampshire recorded, and claimed composership, of the tune as the ‘White Mountain Reel’ in 1970 on County Records 725, ‘The Riendeau Family.’ The seminal revival southern string band of 1970s Seattle, the Gypsy Gypo Stringband, picked this version up and played it for many a square dance. To take nothing away from either of these men as musicians, or Cec McEachern as a brilliant and prolific composer, but the trail of authorship among Canadian recordings is sometimes a bit muddled. Bob Kuzak has helped me out with some scholarship on the Andy DeJarlis compositional attributions; I’ll see if he has any comments on this one.